Speaking on NBA All-Star Baron Davis’ panel today in LA at his Pre-ESPY’s event/ conference (topics on digital media, and more). Baron now develops and invests in tech, lifestyle and digital media companies. One of his notable investments was Vitamin Water. NFL player Marty Bennett, and the CEO of Siltanen & Partners, Rob Siltanen, also spoke. Moderator: Fox Sports’ anchor Chris Broussard. 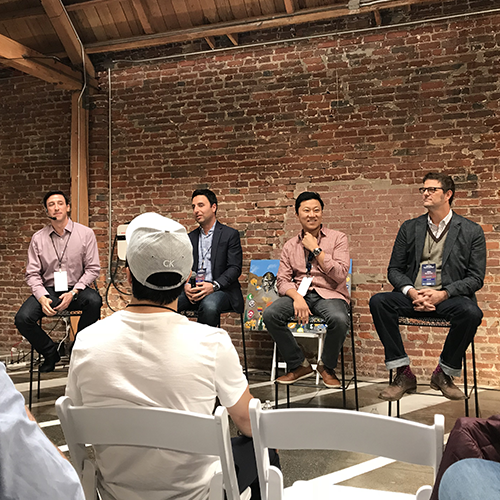 HUTCHESON MODERATES PANEL AT "STACKING GROWTH SUMMIT 2"
Jimmy was asked to speak and share insights about the future of digital media at UCLA Anderson School of Business. Zealot Networks, a digital-first media company that empowers entrepreneurs by delivering multi-platform revenue, distribution and development opportunities, announced today the acquisition of Hutch Media, an online magazine publishing group. The addition of Hutch Media to Zealot Networks begins to fulfill a component of the company's distribution capabilities by offering destinations with niche audience for premium content. Hutch Media operates a collection of digital magazines centered on specific content verticals from entertainment news (RumorFix) and home improvement (HGDIY) to parenting (BestMomsTV) reaching millions of fans and enthusiasts. The company also produces original digital programming and web series for numerous Fortune 500 marketers specifically tied to each of their platforms while also assisting in the distribution and monetization of that content. Companies such as AOL and Scripps utilize Hutch Media for content distribution on its online properties. "Hutch Media represents an opportunity for Zealot Networks to strengthen and elevate an already profitable company by activating our network of companies, lending support with our resources and digital media insight," said Danny Zappin, president and CEO of Zealot Networks. Jimmy Hutcheson is the Founder and President of EgoTVonline.com, an online entertainment network that creates original shows focusing on celebrities, pop-culture, business, sports and music. Jimmy talks about creating content for this new medium and the struggles of building a business from scratch. Online magazine publishing company Hutch Media today acquired the anti-tabloid entertainment website RumorFix.com, created by Jay McGraw. Jay McGraw is the creator and executive producer of the Emmy® award-winning, syndicated daytime series "The Doctors," a New York Times best-selling author, start-up developer, and the son of Dr. Phil McGraw. "With strong market traction and a unique heritage in the celebrity news marketplace, the Hutch Media team is thrilled to add RumorFix to our growing family of entertainment and instructional content," said Jimmy Hutcheson, president of Hutch Media. "We intend to maintain the integrity of the brand, integrate RumorFix into Hutch Media's platform, grow revenues, and expand the audience distribution footprint of RumorFix." Hinting at its ambitions to enter the original publishing realm, digital agency Zealot Networks of Venice has purchased Hutch Media, a small network of websites, for an undisclosed amount of cash and equity. Since its founding last August, Zealot has raised $30 million in venture capital it has deployed to buy a number of online marketing and talent agencies. With Hutch in the fold, Zealot’s desire to build new audiences, likely to sell advertisements against, is beginning to appear. Hutch is a small Los Angeles company that has five employees and runs RumorFix, a celebrity rumor website; HGDIY, a home improvement website; and BestMomsTV, a parenting site. Conn Fishburn, Zealot Networks’ chief strategy officer, said the purchase underscores Zealot’s interest in building targeted content for niche audiences.